What is the difference between flatbread and pizza? Somehow, flatbread seems less fussy to us. No sauce, and a blank canvas for any number of toppings. But really, they are quite similar. Both doughs require a rest period in the refrigerator before baking, a process known as retarding the dough. By reducing the temperature of the dough, fermentation of the yeast is slowed to enhance the flavors. Both pizza and flatbread doughs are rolled thin, then quickly baked at a very high temperature. And both bake best using a pizza stone, an inexpensive yet invaluable investment if you plan to bake flatbreads or pizzas often. Use a peel to slide the dough in and remove it a few minutes later and you'll feel like a real pro. Combine yeast and water in the bowl of your mixer. Let stand until foamy, about 5 minutes. Using dough hook, add flour all at once and mix on medium high. First, a ball will form after a few minutes. Continue until dough is smooth and satiny. Remove from mixer and work by hand for about a minute, until dough springs back quickly when you press on it with your finger. Flour the ball of dough to prevent sticking, then place in a large bowl. Cover well with plastic wrap, then refrigerate. Dough will be ready in about 12 hours (it should have doubled or tripled by then). It will keep in the refrigerator for up to 3 days but punch it down after the first day. Remove dough from refrigerator and divide into three equal pieces. Roll each into a ball, then allow to rest at room temperature for 15 minutes before using. If you're only using one ball, return the other two to the refrigerator in an airtight container. When you later use the extra dough, allow it to rest at room temperature for 15 minutes before rolling out. On a floured surface, roll out dough to an 8" circle. It will be thin. We use a peel to place it directly on a pizza stone, but you can also roll out the dough on parchment paper and then place on a sheet pan before baking. Pre-heat oven and pizza stone to 500° for an hour. Flatbread bakes in about 5 minutes. 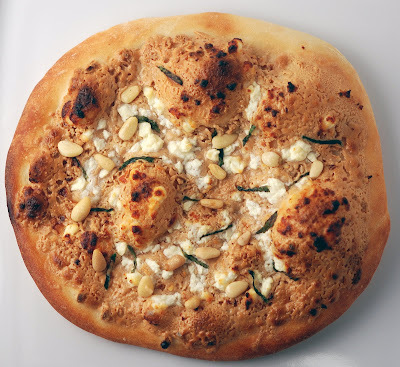 One Flatbread Dough, Infinite Possibilities made the Foodbuzz Top 9 today! The Foodbuzz Top 9 is a photo-driven collection of top-buzzed posts within the Foodbuzz community. Congratulations again, and thanks for being a part of Foodbuzz! Sounds so tasty. I would eat way too much of this kind of thing. This is an important recipe everyone should keep in their rotation. As you mentioned it's can be the center of so many meals. I make it often. I can smell it baking from here! We love flatbread on the grill! with all kinds of combinations. This is so nice! Does this lean more towards the chewy or the crunchy side of flatbread? Way more creative than pizza dough. This looks super delicious. I want to make this ASAP! I love flat bread and yours looks great! wow! I make my own pizza dough very often, but this looks like a nice change of pace. I'm an old hand at pizza, but have never made a flatbread. It looks quite tempting. I love flatbreads and put lots of different toppings on them as in the pizza. Have yet to make homemade flatbreads though, your recipe sounds excellent! This is the reason why I can't go on low-carb. Love this bread. Well done. This is beautiful! I love flatbread.. great pic.